The Hempfield Railroad Company was incorporated in 1850 to locate and construct a railroad projected to run about 76 miles from Wheeling all the way to Greensburg, Pennsylvania. During the construction, the city of Wheeling granted a right of way through a tongue of land where an old town cemetery, Peninsular Cemetery, was located. Most of the bodies were moved and Hempfield Tunnel 1 was built straight through the hill and underneath the old cemetery. The tunnel was not only used by trains, but it was also a shortcut for travelers making their way from one part of the city to another. One man who would use this route was a 34-year-old German immigrant going by the name of Joseph Eisele. He had come to the U.S. in 1865, assuming the name of John Schafer to avoid being deported for crimes in Germany. He first began employment as a cabinetmaker in a furniture factory. Here, he met Joseph Daris, a German woodcarver who was doing work for the Catholic Church in Wheeling and Parkersburg. Daris would take the seemingly-likeable younger man under his wing and provide him work in both Parkersburg and Wheeling until Eisele found a higher paying job in Parkersburg. Eisele made friends easily. He also spent his money frivolously. It wasn’t long before he was deep in debt. Such, Eisele found himself along Sixth Street in Parkersburg on the early edge of morning as the moon began to ebb away, returning to old thieving habits he had thought he had left behind in Germany. He murdered his first victim, Joseph Lilienthal, for his watch in Parkersburg with a carpenter hatchet at four o'clock on the morning of June 15, 1867. Rudolph Tsutor, a close friend of Eisele, was the murderer’s next known victim on December 6th of 1867. He was killed at his home on Harris Street in Parkersburg at ten in the morning by a blow on the head and with the same hatchet used to kill Lilienthal. Eisele calmly helped as a pall-bearer at Tsutor’s funeral. The hatchet murderer would have gotten another victim in January of 1868 when he would enter the coal company office of John White at about eight in the evening to pay a coal debt on Juliana Street in Parkersburg. While White settled into his desk and prepared the receipt for Eisele’s payment, Eisele drew his hatchet from his pocket and commenced to clobber White about the head and neck with the weapon awkwardly and without killing blows. White was able to grapple with the hatchet. Eisele, realizing he was going to be overcome, escaped into the street where he was caught and subdued. It was not until Eisele wrote out a confession that enforcement authorities became sure that a third victim could be tied to his hatchet murders. Eisele had taken ten days to arrange for a close friend by the name of Alois Ulrich, a new immigrant, to join him in work in Wheeling. Ulrich was murdered inside Hempfield Tunnel—killed with blows to his temple, arms, and fingers. Then he was dragged to the far end and concealed in a culvert near the east mouth of the tunnel. His date of death was estimated as June 29, 1867. Eisele became known as the Hatchet Slayer…and author. Before his execution, he wrote a book “Life and crimes of Joseph Eisele, alias John Schafer, The Parkersburg Murderer Published for the benefit of his wife and child” describing his murder spree and himself in great detail. However, it would be his victim, Ulrich, who would become most famous. It is his ghost who haunts the interior of Hempfield Tunnel in Wheeling. 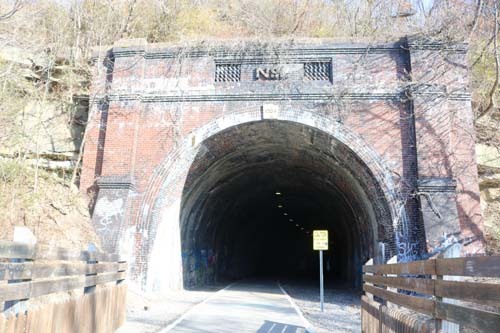 Because it wasn’t long after the body of Alois Ulrich was found in the culvert when travelers taking the shortcut through Hempfield Tunnel began hearing what could only be described as deep groans and cries of a man begging for mercy. Then, directly over the area where Ulrich had been murdered, a ghastly form emerged on the ceiling swathed in the green slime certainly gathered from the dead patrons left in the cemetery above and his own rotten flesh. His arm was extended with bloody fingers hanging half-severed from the stems. The forefinger of the other hand was pointing desperately at the temple where a huge gash lay, fresh but with dark, clotted blood. A guttural groan would slip from the throat telling those who would hear-- Let the dead rest! Then the ghost would sail away. 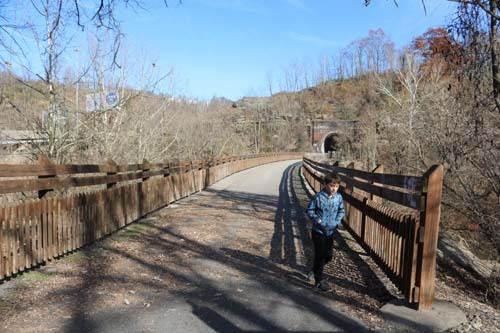 Now, the tracks are gone, and the area has become one of The Wheeling Heritage Trails—The Wheeling Creek Trail which runs on the former rail line through Hempfield Tunnel. 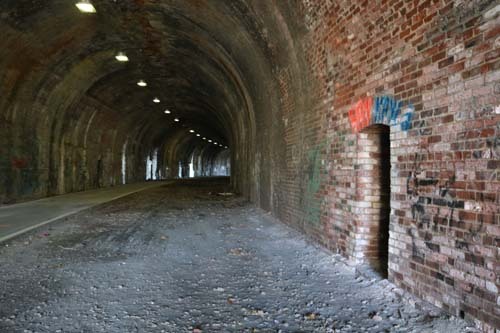 You can access the tunnel via Wheeling Dog Park (17th St in Wheeling 40.070443, -80.710420) It is lighted and well-maintained barring the typical graffiti. And some believe, the tunnel still holds the ghost of Alois Ulrich. 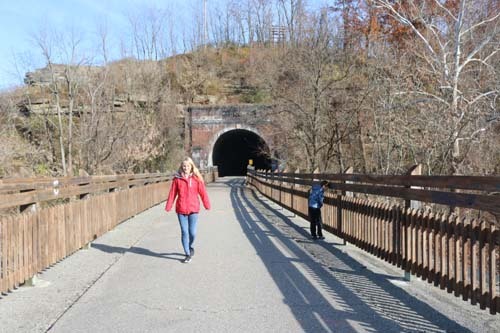 Wheeling Creek Trail which runs on the former rail line through Hempfield Tunnel. Park at Tunnel Green near the Wheeling Dog Park. You'll see the wooden trail bridge and there are wooden steps to walk to it.